Naturally formed bridges along the coastline of California are truly works of art by the erosive forces of water and wind. 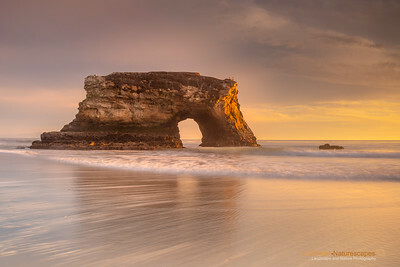 One of the best natural bridge exists on the aptly named Natural Bridges State Beach at Santa Cruz. These bridges form because crashing waves converge at a point and slowly erode away the rock creating a passageway. The erosion eventually destroys the bridge but new ones keep forming over a geologic time span of hundreds and thousands of years. In that sense these are transients, and like everything else that is beautiful in nature, these exist only for a short time... Go see them today! 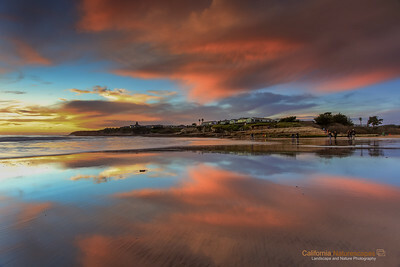 "Reflections: Last Sunset of 2012" Location: Natural Bridges State Beach, Santa Cruz, California. Map Tech Info: Camera: Canon EOS 5D Mk II Lens: Canon EF 17-40mm f/4L IS at 21mm Exposure: 0.8sec at f/14 and ISO 50 Filters: A 3-stop (0.9) and a 2-stop (0.6) LEE Graduated ND Filters stacked together Post Processing: Minimal post processing needed for this shot. Everything captured in single exposure. Naturally formed bridges along the coastline of California are truly works of art by the erosive forces of water and wind. 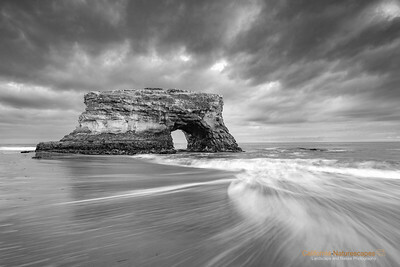 One of the best natural bridge exists on the aptly named Natural Bridges State Beach at Santa Cruz. These bridges form because crashing waves converge at a point and slowly erode away the rock creating a passageway. The erosion eventually destroys the bridge but new ones keep forming over a geologic time span of hundreds and thousands of years. In that sense these are transients, and like everything else that is beautiful in nature, these exist only for a short time... Go see them today! 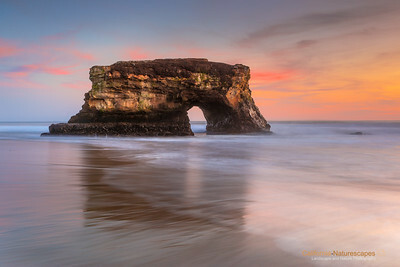 "The Arch" Location: Natural Bridges State Beach, Santa Cruz, California. 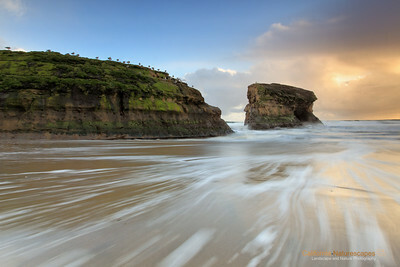 [Map/GPS] Here is my first picture of the Natural Bridges State Beach that was shot this year. I have made several images of this iconic arch and each of those has been challenging to pull off. Today was no different. I setup my camera and waited for the good light but too many people were walking in front of the camera. After about 10 minutes of waiting I finally got a good view of the arch. The sunset was happening at the same time and colors were just perfect. Tech Info: Lens: Canon EF 17-40mm f/4L at 19mm Camera: Canon EOS 5D Mk II Exposure: 0, +1 and +2EV for a manual HDR image. Filters: LEE ND Grads 0.6 (2-stop) and 0.9 (3-stop) soft edge filters rotated slightly to cover sky on the right side Post Processing: Manual HDR is essentially manually blending multiple images to obtain desired tonality and dynamic range in an image. It is fairly easy to do in PhotoShop. Naturally formed bridges along the coastline of California are truly works of art by the erosive forces of water and wind. 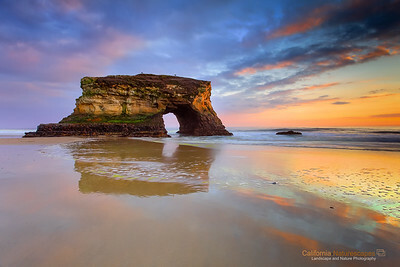 One of the best natural bridge exists on the aptly named Natural Bridges State Beach at Santa Cruz. These bridges form because crashing waves converge at a point and slowly erode away the rock creating a passageway. The erosion eventually destroys the bridge but new ones keep forming over a geologic time span of hundreds and thousands of years. In that sense these are transients, and like everything else that is beautiful in nature, these exist only for a short time... Go see them today! 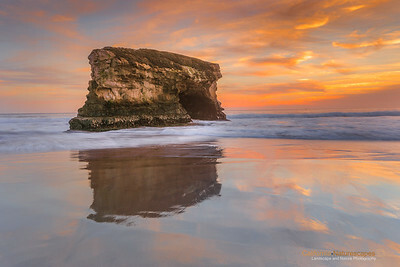 "Reflections" Location: Natural Bridges State Beach, Santa Cruz, California. 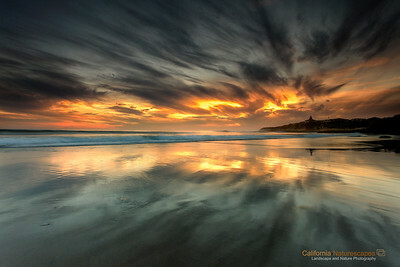 A low tide and an awesome sunset along with interesting cloud formations careated perfect conditions to enjoy these reflections in the sand. Though this bridge is famous for its natural bridge, I often like to visit here just to see the reflections in the sand. The sand here retains the water long after the wave has receded allowing for spectacular displays of reflections. Tech Info: Lens: Canon EF 17-40mm f/4L @ 17mm Camera: Canon EOS 5D Mk II Exposure: 1.3sec at f/13 and ISO 50 Filters: LEE ND Grads Naturally formed bridges along the coastline of California are truly works of art by the erosive forces of water and wind. One of the best natural bridge exists on the aptly named Natural Bridges State Beach at Santa Cruz. These bridges form because crashing waves converge at a point and slowly erode away the rock creating a passageway. The erosion eventually destroys the bridge but new ones keep forming over a geologic time span of hundreds and thousands of years. In that sense these are transients, and like everything else that is beautiful in nature, these exist only for a short time... Go see them today! "Motion Pattern Abstract" Location: Natural Bridges State Beach, Santa Cruz, California. A long exposure blur on the passing wave created abstract patterns to complement with the sky. Tech Info: Lens: Canon EF 17-40mm f/4L @ 17mm Camera: Canon EOS 5D Mk II Exposure: 1.3sec at f/13 and ISO 50 Filters: LEE ND Grads Naturally formed bridges along the coastline of California are truly works of art by the erosive forces of water and wind. 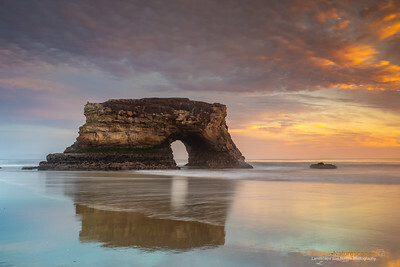 One of the best natural bridge exists on the aptly named Natural Bridges State Beach at Santa Cruz. These bridges form because crashing waves converge at a point and slowly erode away the rock creating a passageway. The erosion eventually destroys the bridge but new ones keep forming over a geologic time span of hundreds and thousands of years. In that sense these are transients, and like everything else that is beautiful in nature, these exist only for a short time... Go see them today! 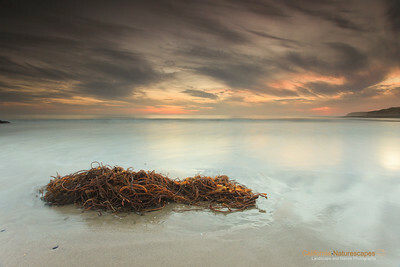 "Tangled Sea Weed" Location: Natural Bridges State Beach, Santa Cruz, California. I was looking for some interesting foreground when I found these seaweed plants washed ashore during high tide. To me the tubular design of these plants is just a miracle of nature. How well adapted that is to an aquatic life. Seeing it washed ashore gave me time to marvel at their beauty and capture this image. Tech Info: Lens: Canon EF 17-40mm f/4L @ 17mm Camera: Canon EOS 5D Mk II Exposure: 8 sec at f/16 and ISO 50 Filters: LEE ND Grads Naturally formed bridges along the coastline of California are truly works of art by the erosive forces of water and wind. One of the best natural bridge exists on the aptly named Natural Bridges State Beach at Santa Cruz. These bridges form because crashing waves converge at a point and slowly erode away the rock creating a passageway. The erosion eventually destroys the bridge but new ones keep forming over a geologic time span of hundreds and thousands of years. In that sense these are transients, and like everything else that is beautiful in nature, these exist only for a short time... Go see them today! "Seagulls on the Seashore" Location: Natural Bridges State Beach, Santa Cruz, California. This was one of the best visits I have had while attempting to shoot this natural arch. 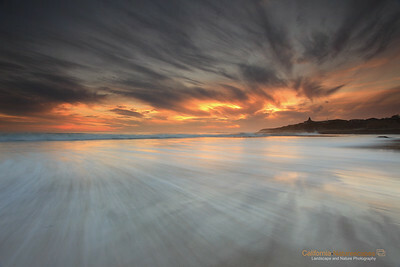 The light was great, receding waves made great patterns and clouds lit up during sunset. This is a view looking at the bridge formation along it's length. The gap in the image used to be another natural bridge which collapsed a few decades ago. I believe you can still see images from that era at the visitor center. Tech Info: Lens: Canon EF 17-40mm f/4L @ 20mm Camera: Canon EOS 5D Mk II Exposure: 1.6sec at f/20 and ISO 100 Filters: LEE ND Grads 0.9 soft edge Post Processing: Key step was to bring out details in the shadows. I did that using Lightroom "Fill light" slider. Naturally formed bridges along the coastline of California are truly works of art by the erosive forces of water and wind. One of the best natural bridge exists on the aptly named Natural Bridges State Beach at Santa Cruz. These bridges form because crashing waves converge at a point and slowly erode away the rock creating a passageway. The erosion eventually destroys the bridge but new ones keep forming over a geologic time span of hundreds and thousands of years. In that sense these are transients, and like everything else that is beautiful in nature, these exist only for a short time... Go see them today!